From Turban to Toe Ring is a guide for designing and making tribal-fusion belly dance wear. This style, which originated in the San Francisco dance community and has spread world-wide, is fast becoming one of the most popular costuming options. Tribal-fusion costuming is an assemblage of design elements pulled from many different tribal, rural, and nomadic peoples from North Africa, across the Near and Middle East, and as far away as India. Surface design techniques, articles of clothing, and jewelry components are fused together to create a look that blends all of these items into an exciting and uniquely individual image for each dancer. This book will be an excellent reference source for the libraries of dancers, costume designers, historical re-enactors, and dancers who want a break from the high glitz and glamour of cabaret-style costuming. 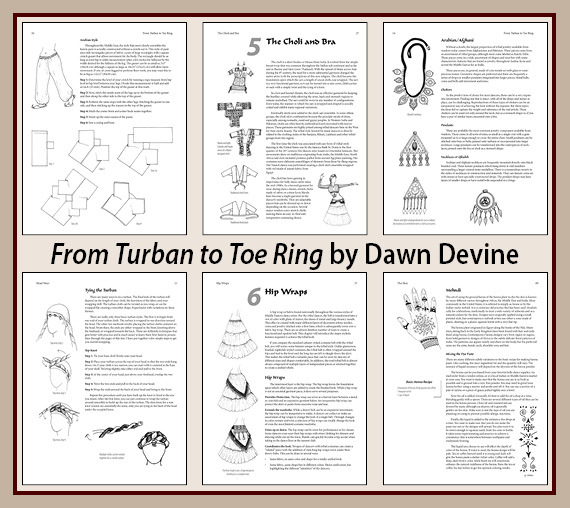 From Turban to Toe Ring contains numerous hints, tips, and directions for making, designing, and assembling a tribal-fusion costume. A country-by-country breakdown of tribal jewelry styles from the Berber people of Morocco to the Ribari of India. Patternmaking directions for several different choli and salwar designs. Directions for traditional surface embellishments, including applique and shi-sha. Mehndi (or henna), from mixing the paste to creating your design. Adapting Indian textiles, such as the toran and chakla, for tribal-fusion dancewear. An extensive bibliography and guide to historical research of Middle Eastern costume is included. Dawn Devine is a costume historian and belly dancer living in California’s San Francisco Bay Area. She has been dancing for over fifteen years and has been designing historical costumes nearly all her life. She has degrees in both Art History and Fashion Design.